When I think of what I really want on Mother’s Day, my list would most likely have “no laundry”, “all the cooking done”, and “no dishes” on it. 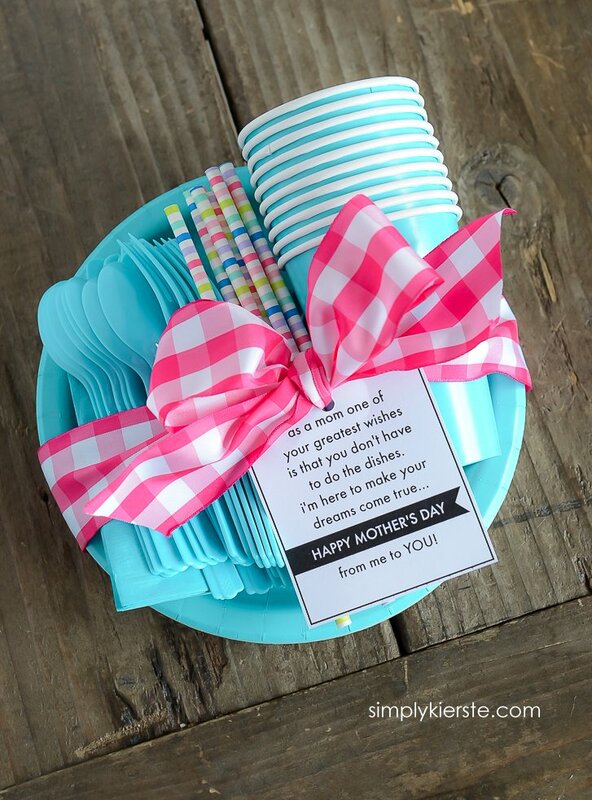 I’m pretty sure that all moms would appreciate any of these things as a Mother’s Day gift, but I’ve got you covered when it comes to the no dishes part of things! What mom wouldn’t love a night off of doing dishes? I know I would! 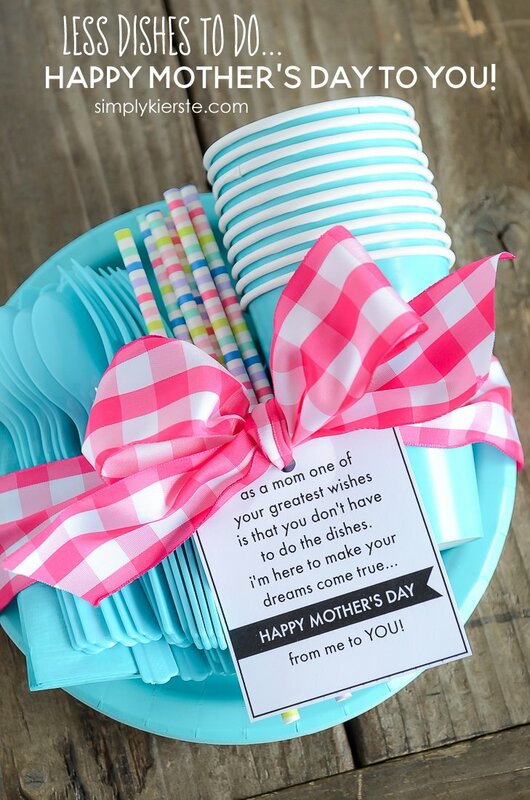 I’ve always loved this idea of giving a mom the night off from dishes, and this year I decided to go ahead and make up a fun printable to go with it. It’s the perfect gift for any mom in your life–a brand new mom, friends, ladies you visit, neighbors, teachers, sisters, and your mom and mother-in-law! It’s wonderful for Mother’s Day, but you can give it anytime as a pick-me-up or thinking of you gift. Give the gift of less dishes…it’s the best gift ever! I bought all of my paper goods except the paper straws at Walmart. They were 99 cents each, so only $4 for all of it! I already had the paper straws (because I’m just a little obsessed with them, and probably have enough to start my own paper straw store) and the ribbon came from Michaels. I went for plain tableware, then added the fun accents with the straws and ribbon. You can certainly do it the other way around as well! You can also find larger packs of tableware, and split them apart–it just depends on how many in the families, and how many you want to give. 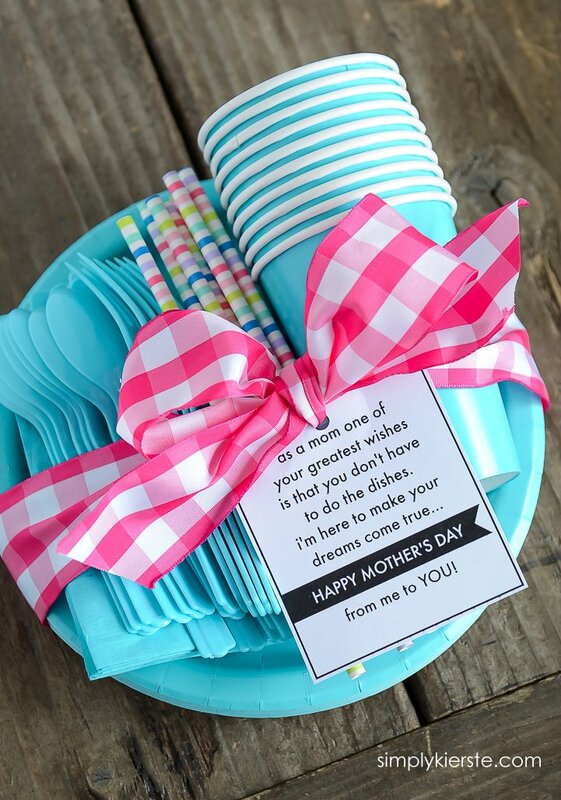 Stack them all together (you might want to tie a piece of baker’s twine around the tableware and the straws so they stay put), then tie the ribbon along with the printable around the whole thing to secure it. So cute. So easy. So perfect! I have a printable for Mother’s Day, plus one that can be used anytime–perfect for giving to new moms, or for a thinking of you gift. Just click on the link below, save to your computer, and print on to white card stock! 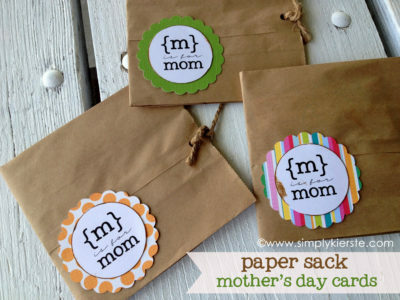 Here are a few more Mother’s Day ideas you might like! Kierste this is the perfect gift for all my mom friends! Thank you for such a cute idea. Printing off a bunch now. Seriously LOVE this!!! So cute! Taking the gift ASAP to the women I visit teach…. Then going back with the Mothers Day one as well! 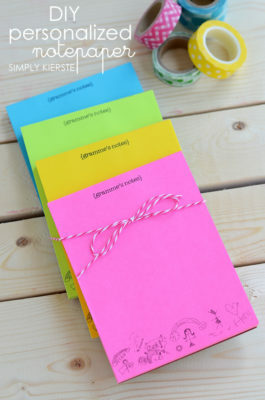 Who doesn’t love cute paper goods each month! What a perfect gift to give to friends and neighbors who are having a bad day or surgery or just a “I am thinking of you today” gift!! Thank you for the perfect idea! LOVE it! AND love YOU! Thanks for doing the hard work for me and for sharing! Kierste, I just love all of your ideas!!! I was wanting your thoughts on the footstool project though! Id love to do this with my kids, however I have 6 of them. Are there footstools that fit six feet? and where would i find it if it exists? I’m in the same dilemma, because now I have six kids! I made the stool with five kids, and it worked perfectly. I think I’m going to end up making one, because then I can do it the exact size I need. I would measure your kids feet width-wise, then search for stools with those measurements and see what pops up. I don’t think it’s impossible, but perhaps a little harder to find. If I find anything I’ll let you know! Good luck!! !